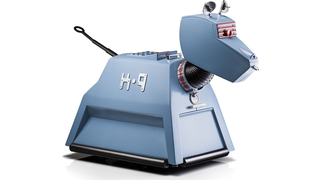 There's been a few remote-controlled K-9 toys over the years since the Doctor's canine companion trundled his way back into our hearts with the revived version of Doctor Who — but this latest version uses a smartphone app to give you the ultimate Robot Dog toy! The 1/4-scale K-9 isn't exactly life-sized, but it's still a decent sized toy. Through a dedicated smartphone app, you can can control him through either tilt controls, or if you're less keen on waving your phone around to control your robot dog friend, a joystick on your touchscreen. There's also options to get K-9 to go into "attack mode", extending the laser gun in his nose and making sounds, as well as a set of phrases from the show for him to say as he rolls around. Even his 'eyes' light up and his ears move around! D'aww. The smartphone controlled K-9 is available now in the UK for a pretty pricey £70 (around $100! ), but will probably make its way to US stores in the near future. We all need some robot dogs in our lives.